The Miami Trace Athletic Department on Tuesday, Feb. 7, presented George Hellenthal with a lifetime achievement award for his over 40 years of service to the school. 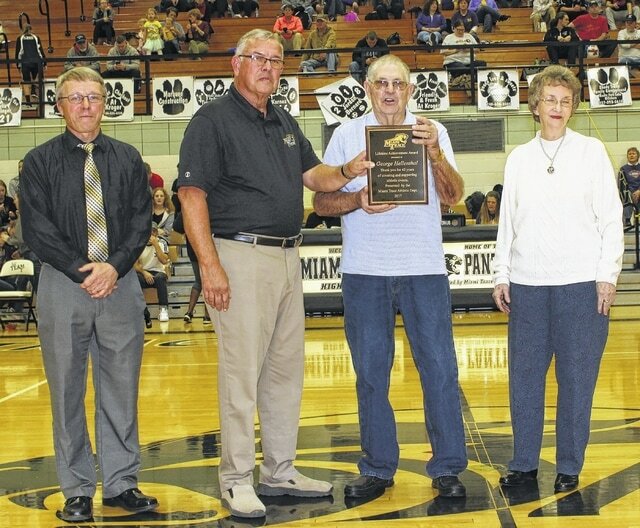 Hellenthal and his wife, Bonnie, married for 62 years, were joined on the court by Charlie Andrews, former athletic director and currently a member of the Miami Trace school board and the school’s principal, Rob Enochs, for the halftime ceremony. A statement read in part: Forty-two years ago, George began providing coverage of Miami Trace athletic events as a member of the Sheriff’s auxiliary. Over that period of time, George was witness to and experienced many of the successes of our athletic programs. George was thorough in his work and worked to ensure the safety of both participants and spectators. George also served for six years as the coordinator of the auxiliary and for over 20 years was a member of the rapid response team. George and Bonnie have three sons, Kenny, Kevin and Kris. Without Bonnie’s support, George’s dedication to Miami Trace would not have been possible. https://www.recordherald.com/wp-content/uploads/sites/27/2017/02/web1_George-Hellenthal.jpgThe Miami Trace Athletic Department on Tuesday, Feb. 7, presented George Hellenthal with a lifetime achievement award for his over 40 years of service to the school. Hellenthal and his wife, Bonnie, married for 62 years, were joined on the court by Charlie Andrews, former athletic director and currently a member of the Miami Trace school board and the school’s principal, Rob Enochs, for the halftime ceremony. A statement read in part: Forty-two years ago, George began providing coverage of Miami Trace athletic events as a member of the Sheriff’s auxiliary. Over that period of time, George was witness to and experienced many of the successes of our athletic programs. George was thorough in his work and worked to ensure the safety of both participants and spectators. George also served for six years as the coordinator of the auxiliary and for over 20 years was a member of the rapid response team. George and Bonnie have three sons, Kenny, Kevin and Kris. Without Bonnie’s support, George’s dedication to Miami Trace would not have been possible.